Leliel is a Grim Reaper who made a mistake. 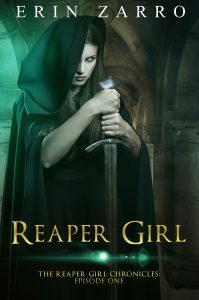 She tried to reap the soul of a man who wasn’t dead, and now she has to fight the Underworld to get it back…and somehow resist falling in love with him at the same time. Originally appeared in Under Her Protection: Stories of Women to the Rescue. Erin Zarro is an indie novelist and poet living in Michigan. She’s married to her Prince Charming, and she has a feline child named Hailey who she’s convinced is part vampire. She loves all things scary and spooky, and is on a mission to scare herself, as nothing lately has scared her. She writes in the genres of sci-fi, fantasy, and horror. Her first published novel, Fey Touched, is a blend of sci-fi and fantasy. She just released her first nonfiction book, and is trying to stay out of trouble. Mostly.